Finally, a new painting! March was my best ever month as far as sales go, and my all time worst month as far as actual creating. I spent so few days actually painting that I’m starting to go a little squirrely. Painting is like meditating for me, the only time I seem to be able to get the hamster out of his wheel and just breathe, focus on what’s right in front of me and not try to brain juggle 1000 different things. I set aside several blocks of time last week to just paint, but now I’ve got so many ideas bouncing around in my sketchbook I can’t decide what to work on first! Normally this would be a happy problem and I’d just dive right in, knowing that there’s always tomorrow to work on one of the other characters that are begging to be brought to life; now that I’m actively working on how to market myself as an artist, I’m feeling the pressure to pick a style and stick with it. 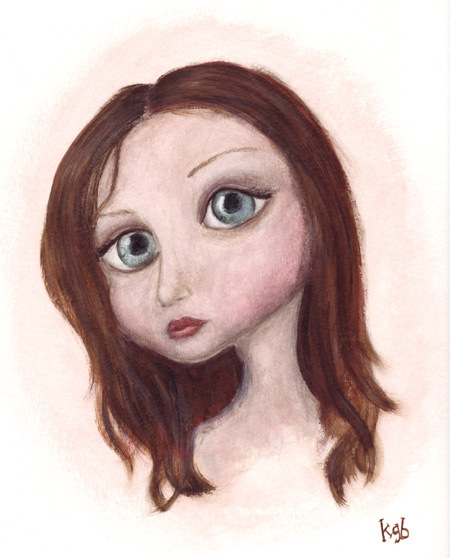 If I’m going to paint cute critters (which seem to be very popular), I need a totally different marketing plan than if I’m going to paint creepy girls. Sweeter girls? Still life? Ditto. Ditto. Oh and I’m really wanting to get into papercuts and sculpture lately too! Before I let myself get totally paralyzed by the decision to define my work as an artist, I think I need to spend more time playing, creating without worrying about the end result. I know all of the books I’m reading are well-intentioned (and probably right), but I think it’s also safe to say that if I’m not painting anything, I’m not going to make much money! And with that, I bring you “Allison”, the first in a series of portrait studies painted on heavy cold press French paper. Before I start a new painting, I will usually spend several hours sketching, playing with ideas and letting my new friend dance to life. With Allison I decided to take this practice a step further and paint a full portrait. By not painting in a background or the rest of her outfit, I’m allowing myself time to focus on the most important part (in my opinion) – her eyes. Also, since the portrait studies don’t take as long to complete, I’m able to offer them as a more affordable way to own a true original. Hi! I just checked out your new painting at your shop and it’s awesome. I am going to check out some of the links in your categories now, too. Art classes and education caught my eye straight away!